As the Mega Millions jackpot has reached record levels, the National Council on Problem Gambling urges consumers to protect themselves against excessive gambling and calls upon lotteries and the media to promote responsible gambling messages. A lot of you may be wondering about the potential impacts of the recent Supreme Court decision in Murphy v. National Collegiate Athletic Association. On May 14, 2018 the US Supreme Court declared the federal ban on sports betting to be unconstitutional. By repealing the Professional and Amateur Sports Protection Act (PASPA), the Supreme Court opens the door for any state to legalize sports betting. The National Council on Problem Gambling believes the ruling by the Supreme Court is the largest potential expansion of gambling in our nation’s history now that an additional 49 states have the opportunity to legalize sports betting. We believe the expansion of legalized sports gambling in the United States will likely increase gambling participation and gambling problems unless serious steps are taken to minimize harm. Approximately 85% of Americans either gamble or approve of it. We know that there is already a vast amount of illegal sports betting occuring across America. And kids are already frequently exposed to parental gambling plus advertising and promotion for unregulated offshore gambling in media and online outlets. Expansion will likely increase availability and acceptability of sports gambling and thus increase participation, which may lead to more gambling problems. Unfortunately, this has not been uniformly accompanied by appropriate—or in some cases any—funds to prevent or treat gambling addiction. As a result current public problem gambling prevention and treatment services—especially for youth—are insufficient in most states and nonexistent in many. Approximately 2% of adults experience gambling problems, or approximately 5 million people. Gambling addiction is a rare but serious public health concern similar to other disorders that can ultimately lead to psychological, financial and legal problems. Additionally, gambling problems are strongly associated with increased incidence of suicide attempts, substance use disorders, and other behavioral health conditions. These social and economic impacts must not be ignored. The NCPG Board of Directors issued a Resolution on the Legalization of Sports Gambling in February 2017 that included specific recommendations on preventing problem gambling and encouraging responsible gaming for three key stakeholder groups: legislators and regulators; leagues and teams; and the media. In March 2018 the Board followed up by issuing Responsible Gaming Principles for Sports Gambling Legislation. Over 20 states have filed legislation to legalize sports betting, few with the types of consumer protections we recommend. Sadly it looks like we may see a rise in gambling addiction over the next few years, which affects all of us. NCPG is the national advocate for problem gamblers and their families. NCPG is neutral on legalized gambling and works with all stakeholders to promote responsible gaming. If you or someone you know has a gambling problem in the United States, call or text the National Problem Gambling Helpline Network at 1-800-522-4700 or visit www.ncpgambling.org/chat for confidential help. We are proud to use iCarol for our text and chat program. Guest blogger Keith Whyte has served as Executive Director of the National Council on Problem Gambling (NCPG) since October 1998. NCPG is the national advocate for programs and services to assist problem gamblers and their families. The National Council on Problem Gambling announces the results of the elections for officers to guide the organization for the 2017-2018 term. Marlene Warner was elected President, Chip Polston was elected as Vice-President and Julie Hynes as Secretary. Ray Pineault was re-elected as Treasurer. All officers serve one year terms, with the President subject to a limit of two terms. To see the complete press release click here. If you’re going to be in Portland for the 31st National Conference on Problem Gambling this week, be sure to stop by and say “hi” to Mary from iCarol who will be there for the pre-conference and will be at our booth in the exhibitor’s area. We’re proud to be a part of this event; the largest and oldest conference of its kind bringing together leaders in prevention, education, treatment, responsible gaming, research, and recovery. We’ll be joining the Pre-Conference beginning July 19th and attending the Helpline Symposium workshop on July 20th. It’s important to us to stay engaged on all the latest with this group and learning the current events and news impacting the industry. iCarol is the chosen provider for a national chat and text collaboration platform for the National Council on Problem Gambling. Several centers and organizations from around the U.S. participate to provide help in states where they provide services. Help seekers from around the U.S. text or live chat with the national service, then iCarol’s comprehensive design reads the help seeker’s location. If there is a center in the network from the person’s location designated to take the chat or text at that time, then the chat or text is sent to them. If there is not a designated center available, a trained back-up center is sent the chat or text. This successful model, which has been in place for a few years now, is great because help seekers get help close or specialized to them when it is available, and either way, help seekers always get connected to help. Contact us if you are interested in a model like this at your organization. On February 28th at 1pm EST, Keith Whyte, Executive Director of the National Council on Problem Gambling, will present a webinar on the topic of sports gambling. About the webinar: One of the biggest current issues in gaming is the legalization of sports gambling. Join Keith to learn more about the political, program and policy implications for the problem gambling field. Our monthly webinars have received great feedback and we are excited to continue this series. NCPG encourages everyone to Have the Conversation about Problem Gambling. Most adults gamble or know someone who gambles, and therefore could benefit from programs to prevent gambling addiction. We believe many who suffer in silence do so because they don’t know why they developed a problem, what gambling addiction is or where to get help. Statistics suggest that 5 million Americans and more than 1 million Canadians meet the criteria for gambling addictions. Of those who struggle with a gambling problem, 75% will also have issues with alcohol and an estimated 38% with other drugs. A staggering 1 in 5 people with a gambling problem will either attempt suicide or die by suicide. This is the highest rate of suicide among all addictions. Advocates are working hard to ensure that problem gambling is addressed as the public health issue it is, but unfortunately many still incorrectly view it as a moral failing or issue of “weak will” much like the stigma that alcohol and drug use has faced in the past. Problem gamblers achieve the same effect from gambling as someone else might get from taking a drug or from drinking. The act of gambling alters their mood. A problem gambler who once achieved a “high” from winning or the rush of playing will continue chasing that same feeling. And just as individuals build up a tolerance to the affects of drugs or alcohol, the same can happen with a problem gambler. As they engage in the gambling activity of their choice, it takes more and more of the experience to achieve the same emotional effect they desire. It’s important to discuss the topic of problem gambling with the help-seekers who reach your helpline who may be at risk or are showing signs of problem gambling. There are specific resources to point them to that can help them confront these issues, discuss them with non-judgmental listeners, and receive referrals for assistance. Visit NCPG’s website for information and resources. You’ll also find the number where you can call/text for help (1-800-522-4700) and a link to their live chat. 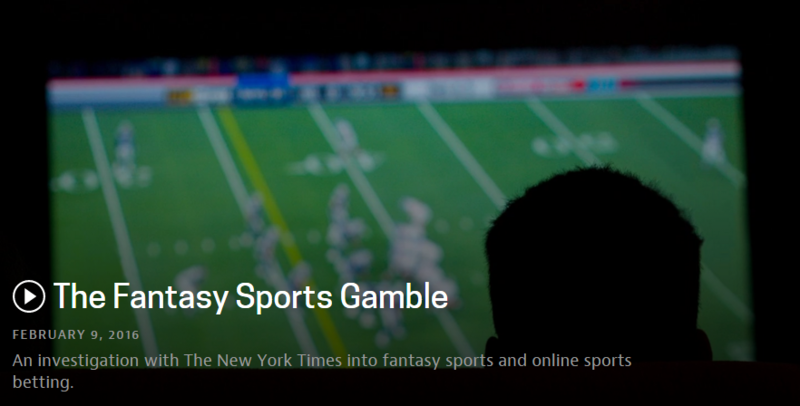 On February 9th PBS will air a Frontline/New York Times documentary about fantasy sports and online sports betting. The documentary will explore the growth of these businesses, go inside their operations at home and abroad, and discuss how regulatory entities, law enforcement, and legislators are grappling with it. Our friends at the National Council on Problem Gambling played a role in the documentary. Executive Director Keith Whyte was interviewed but it’s not yet known if that footage will be included in the documentary when it airs. Keith and NCPG’s participation helped ensure that people affected by problem gambling and their stories were included. This documentary, through its national broadcast, has the potential to educate millions of people on the topic of problem gambling, including fantasy sports, which some feel does not qualify as gambling and shouldn’t be subject to the same regulations as casinos and other established gambling purveyors. You can read that full advisory here. We hope you’ll check out the documentary when it airs, and for now you can watch the trailer below. In a press release published earlier this week, the National Council on Problem Gambling shared information discouraging gift giving of lottery tickets and other related items to minors this holiday season. Donna and I recently returned from the National Council on Problem Gambling‘s annual conference, and we had such a great time! This year’s conference was held in beautiful Baltimore, Maryland. Since I’m from Maryland and still live there, I was quite excited about attending this conference. It’s always fun when so many people from all over the country or world are visiting, perhaps for the first time, a place with which you’re quite familiar. I had a fun time all week sharing little tidbits about my home state with people from out of town. 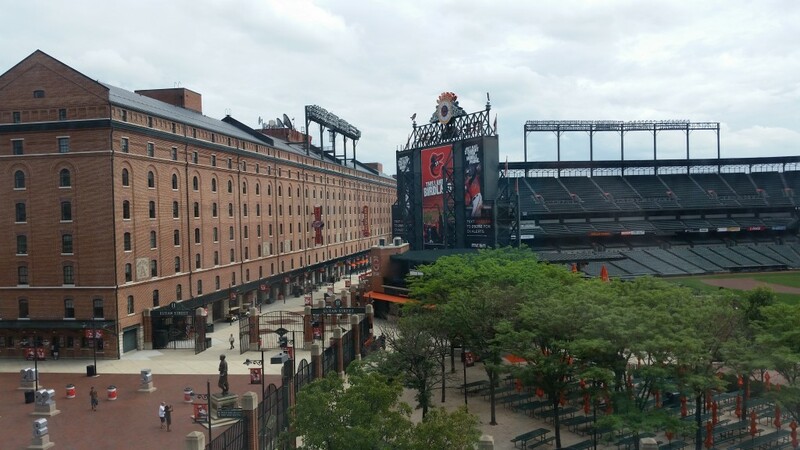 And, if you ever travel to Baltimore I highly recommend the hotel where the conference was held, the Baltimore Hilton right across from Oriole Park at Camden Yards. Perfectly centrally located for all sorts of fun activities in the city including baseball or football games, and the world famous Inner Harbor. Plus the conference rooms and all the accommodations for the conference were top notch. Check out this photo taken from my room as the sun sets over Baltimore. In the center of the photo is the Baltimore Convention Center, just to the lower right of that is the famous Otterbein Church, and if you look just above the Convention Center you’ll see the Inner Harbor in the distance. Like I said, centrally located! We were invited to attend and present at the pre-conference Helpline Symposium. 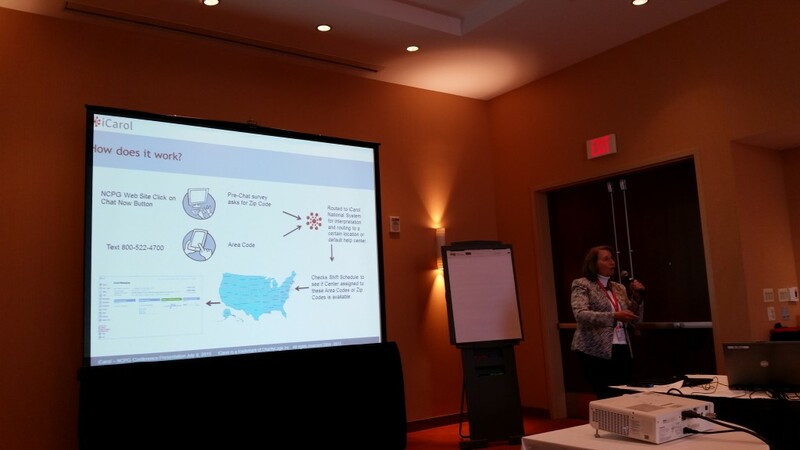 This was an exciting opportunity to show many of the NCPG affiliates all around the country how iCarol chat and text works. iCarol is the provider for NCPG’s national text and chat lines, so when a chat comes through that website or a text comes through that national text number, it will be routed to an affiliate center based on routing criteria like availability and location. So, as affiliates choose to come online and be part of that national chat and text network, we’ll be ready and delighted to help get them set up on iCarol. It’s another great example of the networks and collaborations that can be built using iCarol. We hope to bring you more information about this network and how it’s growing as time goes on. Here’s Donna presenting information about the national chat and text network. Special thanks to Robyn from the Louisiana affiliate and Amy from the National Council on Problem Gambling, who helped us do a live demonstration! The Helpline Symposium was a great chance to hear from affiliates about their experiences. A number of really interesting topics were discussed, such as marketing challenges facing the industry. Coming up with effective, consistent messaging, and increasing visibility and awareness of problem gambling issues, as well as promoting where people can get help, were all among the topics this engaged and energetic group discussed. 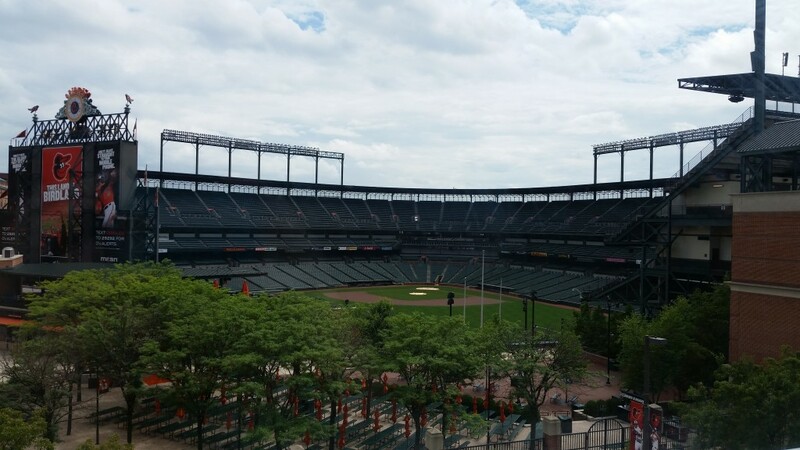 We sure did have a great view from our conference room where the symposium was held, check out the beautiful scene just out the window of Oriole Park at Camden Yards where the Baltimore Orioles play. Throughout the conference the culture of Maryland was on display in the best of ways. 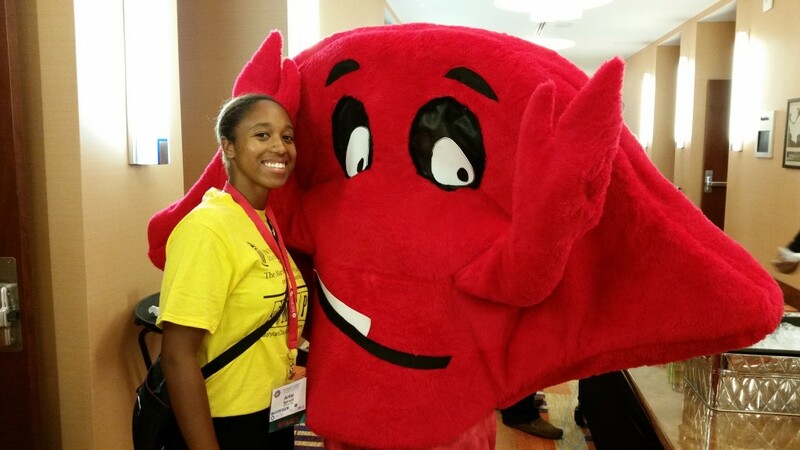 We caught one of Maryland’s famous crabs hanging out with a volunteer during the symposium break! Of course networking and spending time with friends is a highlight of any conference. We took in a delicious dinner at Dempsey’s located right across the street in the Camden Yards complex. 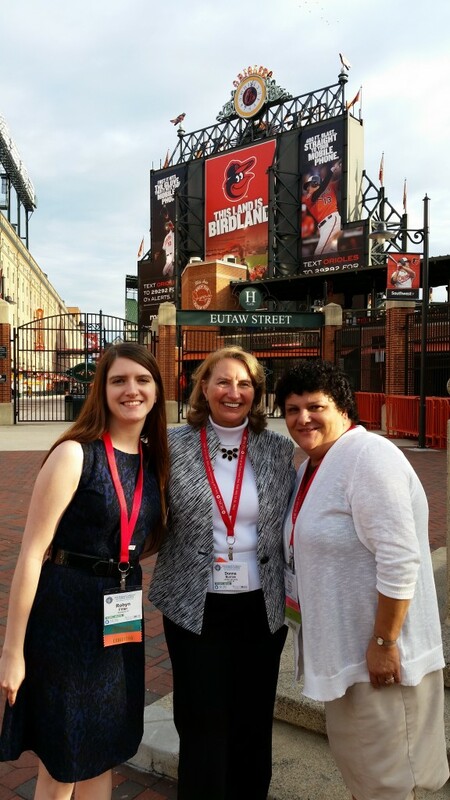 Here’s Donna (center) with industry friends Robyn and Mary posing just outside the ballpark. Before we knew it, it was time for the welcome reception. What a great event! The baseball theme was tons of fun, everyone was wearing jerseys representing their favorite teams. But it gets better — the food was ballpark themed too! Soft pretzels, popcorn, crackerjacks, a sliders station, and it wouldn’t be an event in Maryland without some crabcakes! We got to visit with so many wonderful people from various parts of the industry, too, since the exhibitor’s hall was all set up, where our booth was located. While we’re talking about the reception, I’ve got to give a huge shout out to the hosts of the conference, the Maryland Council on Problem Gambling and the Maryland Center of Excellence on Problem Gambling (University of Maryland School of Medicine). Every detail was so great, from the food to the accommodations to the conference rooms and session spaces and fun activities. What fabulous hosts they were! The conference kicked off the next day with a great keynote by psychiatrist Dr. David Mee-Lee, who has worked for years as an expert in addiction both substance and non-substance related, as well as co-occurring conditions. It was a really engaging keynote with lots of comic relief via Dr. Mee-Lee’s slideshow. The breakout sessions were highly informative. I attended sessions on a variety of topics including veteran gambling addiction, gambling addiction as it relates to mental illness such a schizophrenia, and new technologies being used in video gaming units at casinos. I plan to bring you more detail on those interesting topics in the coming months. Another fun networking event was the Friday evening trip to the American Visionary Art Museum in the Federal Hill area of Baltimore. Fun fact: Just two miles further down the street from the museum is Fort McHenry, where Marylander Francis Scott Key witnessed a battle in the War of 1812 and wrote a poem which would later become the lyrics to the United States’ National Anthem, The Star Spangled Banner! See, I told you I enjoyed peppering people with facts about my home state! While no photos were permitted within the museum, I encourage you to check out their website. It was an extremely unique, thought-provoking place unlike any art museum I’ve been to before! Next door to the museum was a reception area with more yummy food (four words: crab mac and cheese!) where we took in an exhibit specifically about problem gambling, with pieces of art by students, people in recovery, and family members of problem gamblers. This was a particularly powerful piece titled “Losing Hand” by artist Jennifer L. Walsh, who experienced the effects of problem gambling through her own mother’s addiction. “Losing Hand: Why Gamble When You’ve Already Won” is an image of a losing hand of poker. 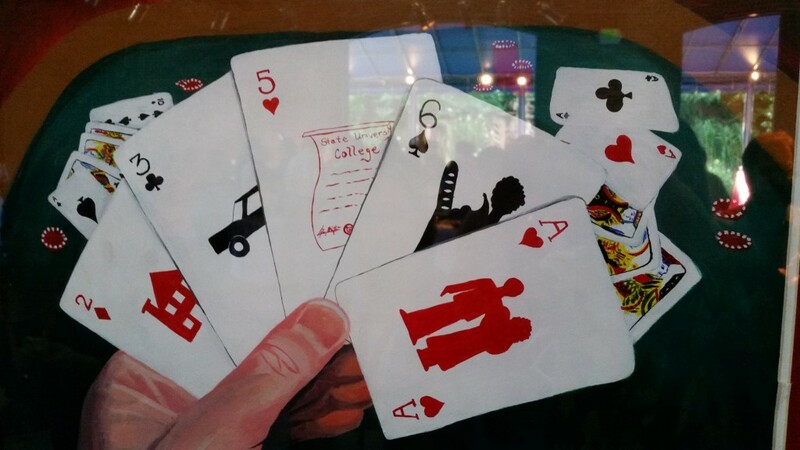 The player’s hand in the foreground is holding five cards, each with an image of what they have accomplished or gained in their life and what they are actually losing when they gamble. The Ace of Hearts is the last card in the hand and is slipping out of the thumb’s grip, signifying the loss of family due to the habit. We had a fantastic time at the conference and enjoyed meeting so many of you in the problem gambling industry. If you didn’t get a chance to chat with us at the conference, please check out our website and contact us for more information on iCarol Helpline Software. Or, feel free to attend one of my regular webinars to get an idea of what we’re all about!